Description: Solid metal Morning Glories, hand finished in Timeless Bronze, swirl amid twisting vines and leaves over an inner band of Verdigris applied onto a Solid Copper band on this intricately elaborate and elegant ceiling fixture. The floral design is also featured on the bottom overlaying a White glass diffuser. This exquisite Meyda original is handcrafted by highly skilled artisans at the foothills of the magnificent Adirondack Mountains in the USA. 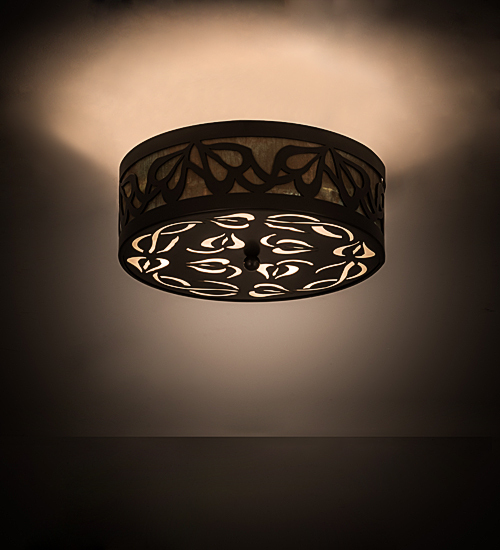 Custom sizes, styles, colors and dimmable energy efficient lamping options are available. The 16-inch wide fixture is UL and cUL listed for damp and dry locations.